What’s the first thing to do if you get a diagnosis of cancer? Grab a deep relaxation and guided imagery CD! Really. It could save your life. When people first receive the message from their physician that their body may be harboring a potentially fatal disease, they are usually dumbfounded, commonly frightened, and often emotionally traumatized. This is unfortunate, since such reactions of helplessness associated with the illness create an internal physiological and psychological state which may actually impair the body’s ability to defend itself against this invader. Since guided imagery in the state of deep relaxation has been shown to assist the healing process in many illnesses, including cancer, it should be made available as soon as possible to anyone newly diagnosed with cancer – as well as those with other chronic illnesses. It’s the least expensive, fastest, and possibly the most important single thing you can do. A patient’s physical comfort and perception of pain can often be markedly altered, as can their attitude, mood, willingness to undergo invasive procedures, or to participate actively in the treatment – even their ability to successfully survive the treatment. All these are profoundly influenced by the attitude and the mental self image he or she has, of the disease, of the treatment, and of those who are rendering care. Certain ways of approaching the illness are far more likely to produce a successful outcome, cure and complete healing. Well-designed guided imagery and deep relaxation – what I call “Software for the Mind” – functions to enable the person to move through acceptance, to awaken the inner potential to heal and become whole, and to free the body of the stress that could otherwise worsen the illness. And the sooner an individual begins this process, the better. I will describe some of the most important ways that these tools can be used as valuable adjuncts to treatment in a moment, but first lets look at the role of your mental imagery in preventing cancer. Of course the best use of guided imagery in confronting the challenges of cancer is to employ it at the stage of prevention Sometimes, for example, a woman with breast lump or unusual bleeding, or a man who notices an abnormal mole on his skin will avoid seeing a health professional because of fear they experience when they consider that this might be a cancer. Yet by avoiding that cognitive dissonance they fail to have the mass removed before it spreads, and while it is still curable. A different mental image can be developed, one which could tolerate the idea of having an unknown mass checked out, and save their lives. One of the physician’s first challenges is how to inform the person that they may have cancer. The mental image the doctor creates in the mind of the patient is very important. Because of this natural reaction of fear, rather than face the emotions, the doctor will sometimes try to be matter-of-fact about it, saying something insensitive, like, “Your tests showed that you may possibly have a rapidly-growing cancer that could kill you within 6 to 12 months. I will take another biopsy today to confirm the diagnosis. Come back in a week and I will let you know what we find out.” Imagine how news delivered that way affects a patient! Yet it happens far more often than you’d think it would. Remarkably, I have heard dozens of stories from patients who were treated like the person in the first example, and sometimes even more crudely. The mental, emotional and physical shock they experienced at this time often proved to be quite catastrophic to their lives, leading to acute emotional problems, and often persistent depression and/or anxiety. It is not uncommon for this kind of shock to create serious disruption of relationships, social and work life – and, as you can imagine, fear of doctors and medical procedures, even when the first diagnosis turns out to be a false positive! How a person is treated by his or her health professional is critically important, and the skills of empathetic communication and guided imagery are most valuable. I have always started my training of medical students with this wisdom. After all, what we want most is a happy, healthy patient. (Verbal First Aid by Dr. Prager is an excellent read for Health Professionals and laypeople alike. Listen to the Healing Times Radio Archive of my interview with Dr. Prager on my show, Healing Times Radio). Once a cancer has actually been diagnosed, there are several opportunities for the use of deep relaxation and guided imagery – to improve healing function and eliminate unnecessary emotional stress (for the diagnosed individual and their support network). As you probably know, stress has been shown, in many scientific studies, to inhibit healing. By using guided imagery you can enable yourself to maintain a positive self-image, a feeling of empowerment, and confidence in your ability to tolerate your treatment well – and to heal. 1. To enable identification with the strong, successful part of the Self – the part that believes/knows healing and wellness are possible. 4. To discover how to let be what is, and to access the inner ability to respond mindfully, and not merely react. In our culture we use denial a great deal. Every physician gets to see at least one person who was so fearful of finding a lump they refused to have the recommended regular examinations. Deep Relaxation provides an excellent way for the psyche to be prepared to accept the truth of the moment – it is the antidote to fear, and it eliminates the reason to avoid seeing the truth. After all, the acceptance of what is true in the moment gives you the power to use the resources you have available to successfully address the situation and gain the best possible outcome. And when it comes to cancer, the outcome is what really counts the most. (Abolish Anxiety is an effective program for dealing with unnecessary fears of this kind). Once relaxation has been achieved positive image outcomes can be suggested and visualized. Guided imagery, along with deep relaxation, is also effective for dealing with the surgery that is sometimes needed by the cancer patient. By using image rehearsal techniques for days or weeks before the surgery, you train the mind and body in how to respond to the anesthesia, the surgery, and the healing. By the time you are in the operating room, your body is primed to go into anesthesia quickly, thus reducing the amount of anesthetic agent your body will have to take in and detoxify – making the surgery safer, and recovery faster. Further, when this is combined with the use of these techniques after surgery there is less pain and swelling, ambulation is faster, and healing time and hospital stay are shortened by about 25% (and that means 25% less opportunity to acquire a hospital-based infection with antibiotic-resistant bacteria). (see Surgery, Operations, and Procedures and Successful Surgery and Recovery). Can The Mind Really Fight Cancer? It is important that when someone gets injured or sick, we see two separate, but related, phenomena – the disease and the illness. In the case of cancer, the disease is represented by the abnormal cells that are attempting to grow without bounds. The illness is the loss of weight, the fatigue, the pain, the feeling of helplessness and hopelessness, the fear that treatment will not work, and the other unpleasant experiences represent the illness. While it has not been conclusively demonstrated, a positive attitude and effective imagery can directly kill all cancer cells, studies have shown they are enormously effective defeating the illness. And when a person is less ill, they have a better chance of responding to any threat to their balance of health, and of surviving treatment that is powerful enough to cure the disease. Some of the imagery approaches that have been found to be effective involve visualizing the cancer cells as being weak, confused, disoriented mutant bodily cells that need to be eliminated. Correspondingly, the cells of the immune system are seen as powerful, wise, and capable of attacking and destroying these cancer cells. Sometimes the imagery used is realistic, and sometimes metaphorical (which is how the mind impacts the body anyway). So a given person may see the cancer cells as mice and the immune cells as hungry cats, or see the cancer cells as outlaws wearing black hats, and the immune system’s cells as the good guys wearing, of course white hats. Still other people have less violent imagery, such as coming into harmony and simply halting the growth of the cancer cells, creating a safe long term balance. In this way the healthy body establishes a balance with a tuberculosis bacterium, thus preventing its spread while not eliminating it completely (a kind of New Paradigm solution).Healing From Cancerguides imagery in this way, while the DVD,Immuno-Imagery, shows how this happens using photomicroscopy as well as interpretive animation. Discussion, comments and questions: At the end of this post you will find a place ‘Join the Conversation’. I would love to hear from you. Feel free to answer some of the questions below or let me know whatever is on your mind. 1. Have you used alternative therapies in Cancer (or other chronic illness)? 2. How about Guided Imagery? How did it work? If you have the unfortunate opportunity to know someone diagnosed with cancer, it is important to show them you care and have them in your thoughts. This can be very difficult to express in such trying times. Try taking a sincere approach by getting them a special gift or taking them out for dinner. In this article, Dr. Miller gives his insight behind a tactful and meaningful way to show your support. About Dr. Miller’s Cancer Support Guided Imagery and Meditation CDs, MP3 Downloads, DVDs and Books. 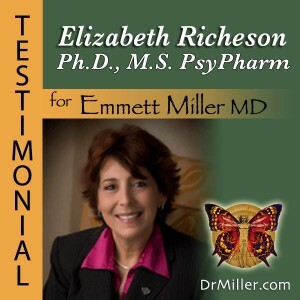 Listen to Elizabeth L. Richeson, Ph.D., M.S. PhysPharm speaking about her own use of Dr. Miller’s Guided Imagery recordings in her profession and in her personal battle with Cancer. Receive 2 Free Gifts when you sign up for Healing Times eNewsletter and we will make sure you are notified of all new radio shows, topics & guests!